Oink! Oink! 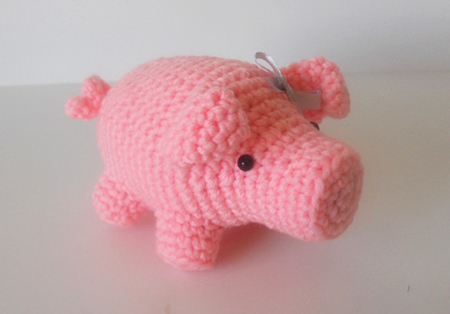 Here is a little pig right out of the yarn farm. 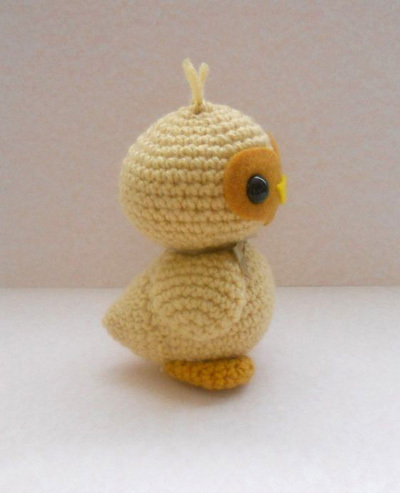 He is very easy to make, anybody will fall for its cuteness! 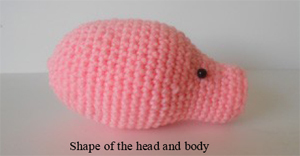 I had several requests for a pig pattern so today I am posting one to make you own Mr Piggy. 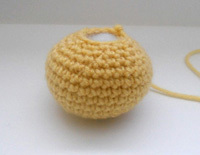 This amigurumi is crocheted in continuous spirals without joining the rounds. – Insert safety eyes, between row 6 and 7, 7 sc apart. – Start stuffing, and continue along the way. – Fasten off. Using a yarn needle, embroider the rest of the stitches together to close the hole. Hide the rest of the yarn in the body. – Fasten off, leave a long tail for sewing. Stuff the legs with fiberfill, and sew them to the body. 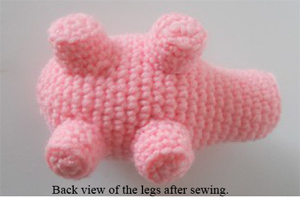 (I recommend that you pin all the legs before sewing to make sure they are placed properly). – Fasten off, leave a long tail for sewing. Do not stuff the ears, leave them flat and bend them at row 5 level. Sew to each side of the head. 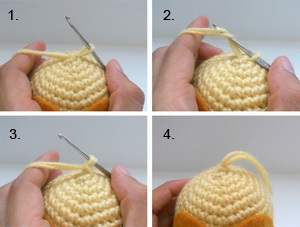 – Use the threads to attach the tail to the body with a tight knot. Hide the remaining threads in the body. 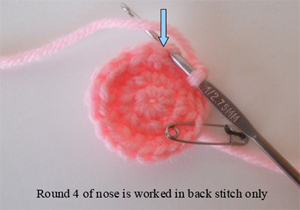 – Use a piece of embroidery thread to make 2 stitches for the nose. – Attach a little grey ribbon, or color of your choice by one of the ears. Voila! 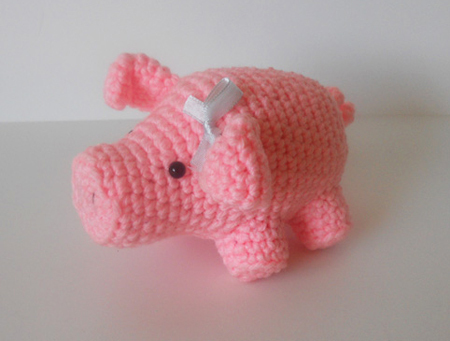 Your cute little pig is done. I hope you enjoyed this pattern, and If you have any questions don’t hesitate to ask me in the comments section. 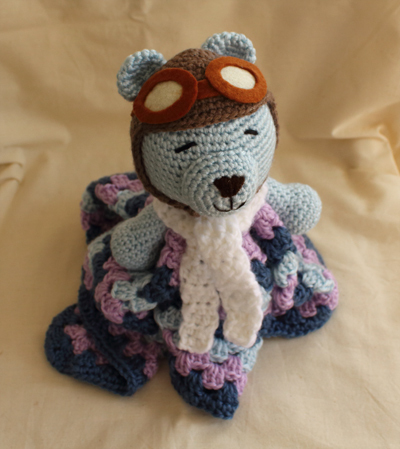 My friend’s son just turned one year old this week, and for his birthday I made him a crocheted security blanket to keep him company when he sleeps, a little teddy bear with a pilot hat and goggles. I used a pattern I found online to make the blanket, but the bear is my own creation. 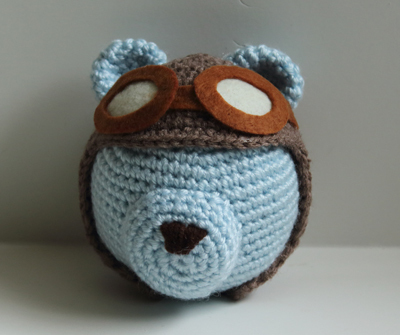 I am sharing the tutorial on this post in case you are interested in making your own little bear pilot. Let’s start with the blanket. 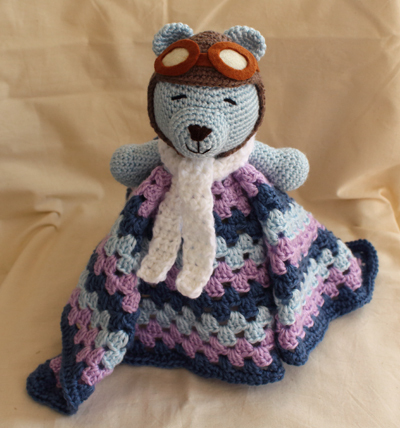 I picked a pattern created by The Stitchin Mommy, called Crochet Lovey Bunny. This is a pattern to make a cute bunny security blanket, but since I had a teddy bear in mind I only used it for the base. 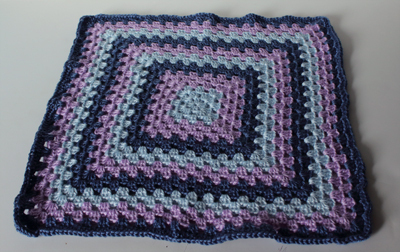 The blanket is a simple granny square that is very easy to make, and looks very pretty. I skipped the last 2 rounds of the blanket because I didn’t want mine to be that wide. Fasten off, embroider loose thread into the stitches to close the hole. ch 1, 4 sc, turn, make 6 rows of sc, fasten off. Attach your yarn on the other side and repeat the same process starting with ch 1. Fasten off, and leave a long tail for sewing. Fasten off, leave a long tail for sewing. Stuff the arm only half way through. You will need brown and cream felt, and a glue gun. Cut two oval shapes in the brown felt, fold them and cut a hole in the middle. 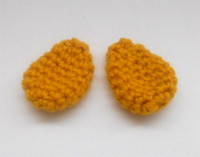 Cut two smaller oval shapes with cream felt and glue them on the brown felt. Cut a small rectangle with brown felt and glue it between the goggles. Cut a band with brown felt,long enough to go around the head, and glue it on both sides of the goggles. Sew the hat to the head, then sew the ears on the top sides of the head. Glue the goggles to the hat, make sure that the band goes around the ears before proceeding. 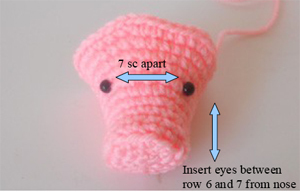 Sew the arms under each sides of the head. You can sew the head to the blanket, but I prefer to glue it first for more sturdiness, then embroider with a piece of yarn thread for extra strength. I used a glue gun for that purpose, I think it works better than fabric glue. About the scarf: I just made a chain of 4 stitches, then hdc every row until I was happy with the length. I hope you enjoyed this tutorial, and if you have any questions don’t hesitate to ask me in the comments section. 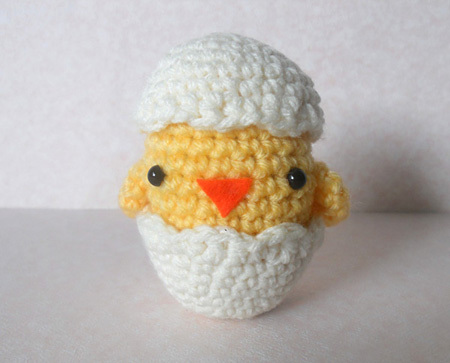 It is Springtime and all the birds are back and chirping, so today I am posting a pattern to make cute little birdie to celebrate my favorite season of the year. 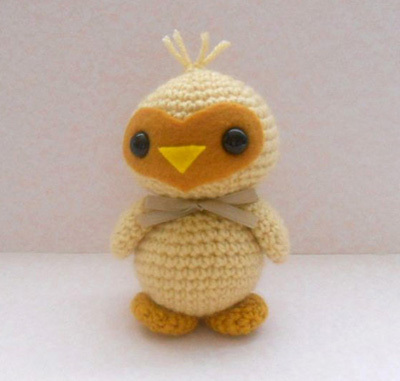 This is a plush I actually made two years ago when I started writing my own patterns, but I do no longer have the little bird because my mum fell in love with it and took it home. This is an easy project, but I took step by step pictures to make it even easier. 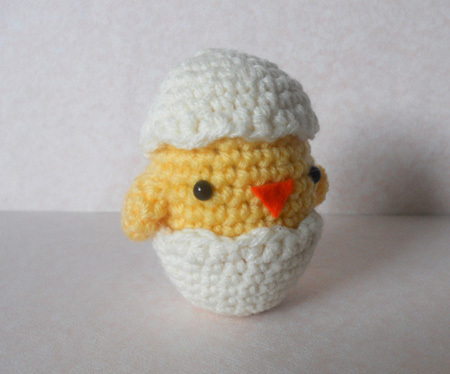 I used a 2.75mm hook because I like tight stitches, but feel free to use a larger hook if you want your bird to be larger. finish size is about 5 inch in height. The face with the heart shape felt and safety eyes. 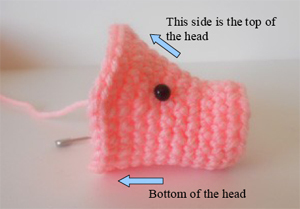 – Glue the edges of the felt on the head with a glue gun, or fabric glue. You don’t need a lot of it, just a small film around the edge is enough. Fasten off, and leave a long tail for sewing. 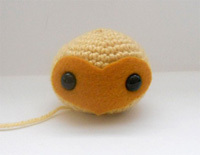 Stuff the body with fiberfill, then sew to the head by embroidering the stitches together. needles on the back of the body, then sew it. Shape of the tail. Sew it to the back of the bird. Fasten off, embroider the thread in the remaining stitches to close the hole. Do not stuff the feet, and glue them to the bottom of the body. way through the back of the foot. I used pins on the feet to check their position before gluing. The feet should be able to keep the body balanced. – Cut a piece of ribbon of your choice, wrap it around the knot and make a bow. 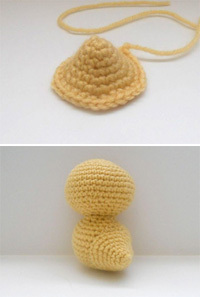 – Cut a piece of yarn, and make a loop by inserting it in a stitch on top of the head. Yarn over thread, pull in loop and close tightly. 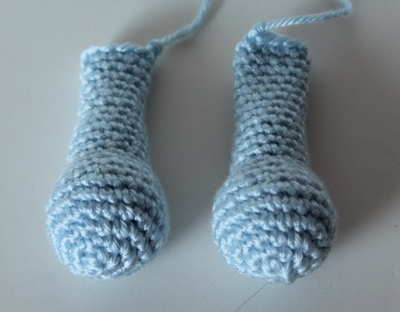 Repeat with another piece of yarn, and cut the threads short. How to make the hair of the bird. Voila! 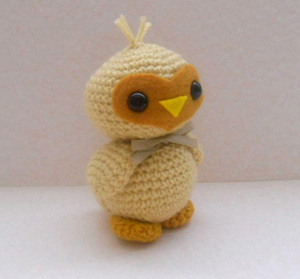 Your little birdy is done! I hope you enjoyed this pattern, and as usual do not hesitate to comment if you have any questions or remarks.